Blindfold me and serve both white and red wines at room temperature, and I probably won't be able to tell one from the other. 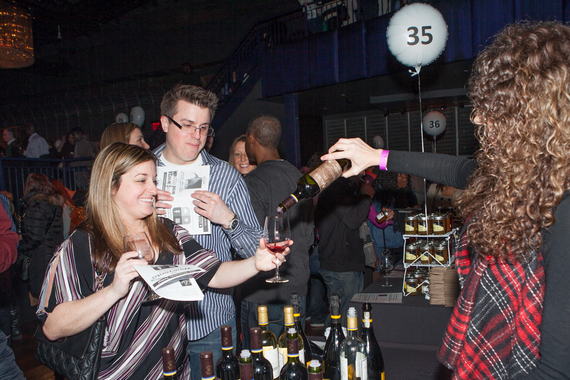 My wine glass wasn't the only thing being filled at the 6th annual NYC Winter Wine Festival earlier this February. I also filled my stomach with savory and sweet bites, while perusing through the magnificent Best Buy Theater in Times Square filled with live music provided by the Grammy-nominated Special EFX. Without a doubt, it was an afternoon filled with joy! Of the two sessions offered--the first in the afternoon from 3 to 6 p.m. and the second in the evening from 8 to 11 p.m.--my boyfriend and I chose the day drinking option. We figured the earlier session would be less popular and therefore less crowded than the later one, but little did we know that both sessions were sold out with a total of 1,800 people in attendance! After making our way through the crowded Times Square, I was a bit intimidated by the long line that formed outside the Best Buy Theater. Luckily, the high ceiling inside the theater provided an illusion of spaciousness, so I didn't feel too trapped among the crowd. Having food in the stomach prior to drinking is crucial, so we first headed to the table featuring wine's best accompaniments, including cheese and crackers, strawberries and grapes, and olives and nuts. While nibbling on these fares, we browsed through different venues pouring endless glasses of white, red, and sparkling wines curated by the experts of Vintry Fine Wines. Despite having attended several wine events in the past and even being a member of the Wine Society in college (admittedly, my roommate was on the executive team and convinced me to join), I will confess that I am no wine connoisseur. In fact, blindfold me and serve both white and red wines at room temperature, and I probably won't be able to tell one from the other. On that note, my favorite "vendor" at the NYC Winter Wine Festival wasn't a vineyard, but a media start-up called Vinepair whose mission is to remove the pretentiousness of wine by educating consumers about this age-old drink. The representatives from Vinepair brought bottles of Cabernet and Merlot wrapped in silver foil. We sampled a sip of both, and had to guess which was which. According to Vinepair, the flavor of Cabernet is more acidic and gives the mouth that drying sensation, while that of Merlot is softer and supple. I can now flaunt this knowledge at a dinner party! 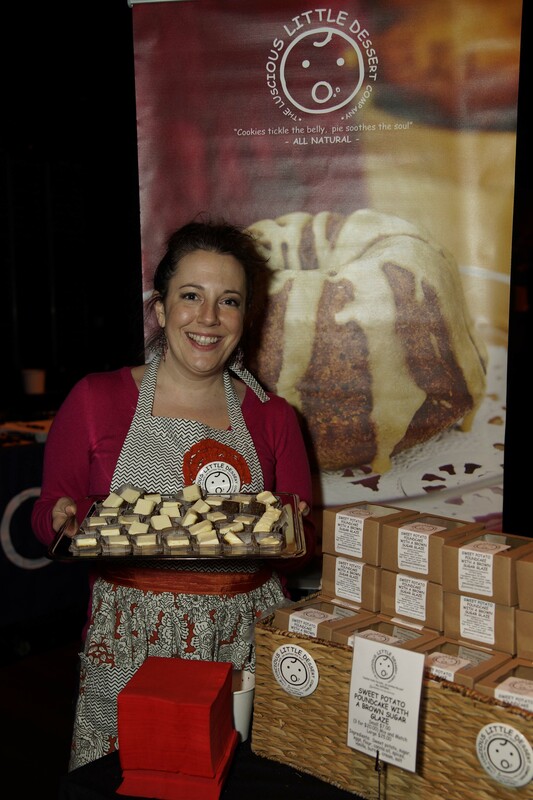 In addition to the wine and the hors d'oeuvres, I also got to sample sweet treats from local artisanal food companies. My favorite were the decadent lemon-lime cheesecake and sweet potato pound cake, both from the Luscious Little Dessert Company. Underneath the top layer of the light, fluffy lemon-lime cheesecake was the chewy gingerbread crust that added an interesting dimension of flavors. Likewise, the moist sweet potato pound cake was drizzled with brown sugar glaze for an extra kick of sweetness. 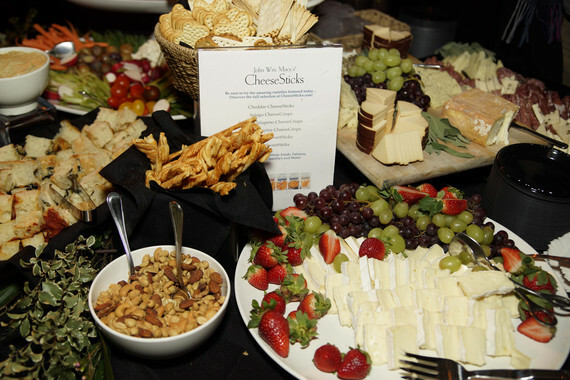 While the general admissions ticket, which gave me access to more than 250 wines, selection of hors d'oeuvres and sweets, and live music, was more than enough to entertain me for the 3-hour duration of the event, this year's event also featured a premium VIP Suite Ticket. Those with the exclusive VIP wristband had access to the lounge area with high-end wines, such as Chateau Montalena, Louis Roederer Cristal, and Dom Perignon, as well as deluxe bites like tuna tartar, fois gras, and filet mignon. About half way into the tasting, the Grammy-nominated Special EFX--led by award-winning guitarist Chieli Mnucci--graced the stage. Founded in 1983, Special EFX is known for paving the road for contemporary jazz during its early years, and has continued to innovate and evolve its style every decade. The smooth jazz music was perfectly fitting for the occasion. 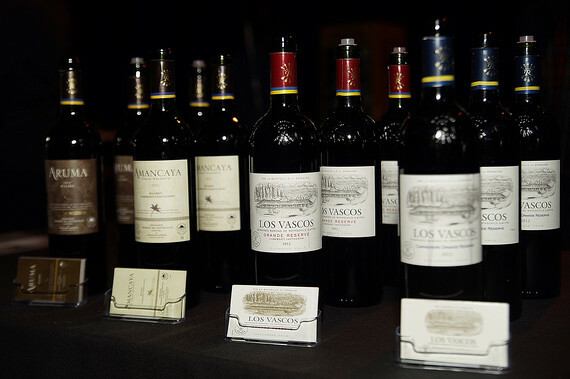 I would still not label myself a wine connoisseur by the end of the event, but the NYC Winter Wine Festival's grand tasting not only introduced me to different wines from around the world, but also helped me to assuage the feeling of anxiety and intimidation that naturally accompanies this drink. Perhaps at future wine tasting events, I will learn to distinguish between Chardonnay and Sauvignon Blanc.